For quite some time, I wanted to write what Google Analytics could improve to make it more useful. Google beat me to it. They just acquired Measure Map for an undisclosed price. January is so far the most visited month. This post shows just what happens when that monster story you have been writing on hits your front page and gets noticed around the globe. Read on for the full statistics for justaddwater.dk / January 2006. I like Wordpress Dashboard. 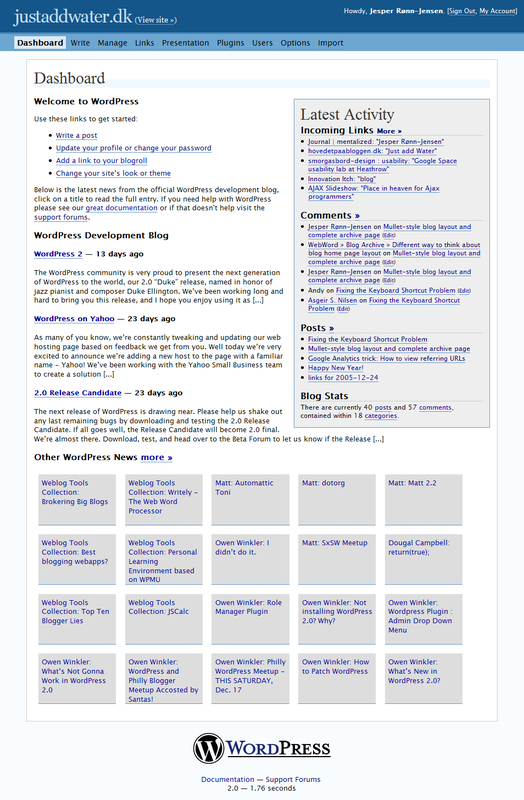 The name suggests that it’s an overview of whats relevant to your blog. What’s happening. What’s popular. Who comments. What important updates are available. The Dashboard should work like in a car. The most important and relevant information should be visible at a glance. Lets have a brief look at the dashboard. I suggest you only take a brief look to judge for your self whether you think the main objectives of the Dashboard page are met. Click on the screenshot above for and look for 5 seconds only. Then ask yourself what you could remember from the page. Yup you just tried a 5 second usability test. We use Google Analytics as a stat tool on justaddwater.dk, and we’re overall satisfied with it. Unfortunately, one crucial feature is hidden and very hard to find. Here is how you find referring URLs and not only the referring websites. We have been online with our Blog for little over a month now. This means that for the first time we now have a full month worth of log files. Since we love sharing we of cause also want to let you know the status of our statistics. Just a quick note on Google and their Analytics tool. This is an update in relate to a previous post in this Blog named “Google Analytics vs. Usability”. Google Analytics – The website statistics service provided by Google free of charge have come to stir up the waters in the statistics business. Here I take a further look into some of the problems that still exists with this beta.